Kids organisation can seem like an oxymoron at times. Any parent who has stepped on yet another bit of Lego for what seems like the millionth time knows the struggle of getting little people to pick up after themselves. The good news is that there is hope for even the messiest of kids. Having a strategy in place will make it easier not only for you to get your little ones organised but also for kids to learn a few basic skills that will hopefully last a lifetime. Keep reading to get our easy to follow, no-fuss kids organisation tips, before that messy room threatens to take away your last bit of sanity. Messy rooms driving you up the wall? Chaos making you feel beyond exhausted? These simple yet effective kids organisation tips will help you find your sanity once again. The Flexa Storage Chest can also double up as a bedside table providing easy access to books and plush toys. Rather than outright bribing your kids to keep bedrooms organised, consider incentives instead. One of the most effective tools for teaching little ones to tidy up and pack away is a simple star chart. To make this work, it is always a good idea to choose small, simple rewards rather than gifts such as toys or treats. There are many great templates to be found online, with age-appropriate ideas for rewards. For smaller kids, you could set simple tasks, such as packing away toys before bedtime each night. For older kids, you could add tasks such as making the bed, keeping desks tidy, putting clothes in the washing hamper and packing away toys or activities. 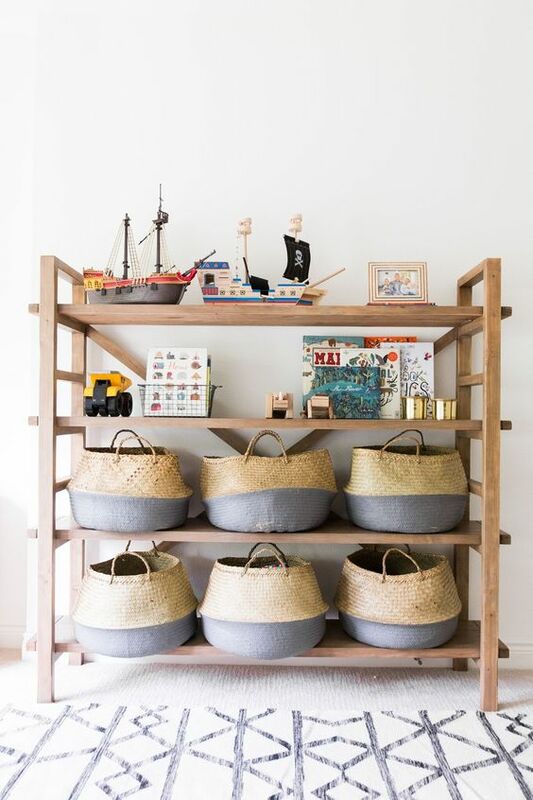 Our Wicker Baskets, with their natural texture, make the perfect addition to the Kika Range and are wide and deep enough to store all sorts of goodies. The easier it is for kids to open and close drawers, the easier it will be for them to pack toys away. Choose kids storage that is low enough for kids to be able to access drawers and shelves without having to stand on chairs or struggle to reach any shelf or drawer. Open shelves, drawers with easy to open handles, baskets, tubs, pedestals that will not shut on tiny fingers, low dressers and child-friendly wardrobes will all make it easier to get into the habit of packing away toys, books and other items with limited or no adult supervision. Set easy to follow routines. Belly baskets are a great storage solution as they’re easy to carry around the house and are also totally gorgeous and on-trend! Another way to encourage kids to get organised is to establish (and follow) daily routines. There are many ways to make tidying up less of a chore and more of a game. You could try looking for a fun song to sing while you tidy. You could gamify the process by seeing who can finish first if you have more than one child (or you are helping your child). You could also model good behaviour by getting the kids involved in your own housework chores. Once tidying up becomes an everyday part of life, it will be far easier for kids to see organisation as a habit rather than a once-off task or something that is better left to the domestic helper or mom and dad. For more tips on how to simplify this process, read our guide to getting your child organised. You can also browse our wide selection of shelving, wardrobes, baskets and tubs and other tools that make kids organisation easier.